As a programmer of a festival, I usually see a performance or an artistic project only once (or I just hear or read about it) before we invite it to be part of our program – that’s why it was very special for me that I could follow SHAPERS during a longer period of time and through different cities before we presented the piece in Budapest. The first time I heard about the project SHAPERS was at Tanzmesse in Düsseldorf at the beginning of September 2016 – exactly 2 years before the presentation in Budapest. The basic idea of a collaboration of dancers from different countries and dance cultures, creating a performance in public space and exploring the possibilities of this kind of work, outside of the traditional places of creation immediately caught my attention. 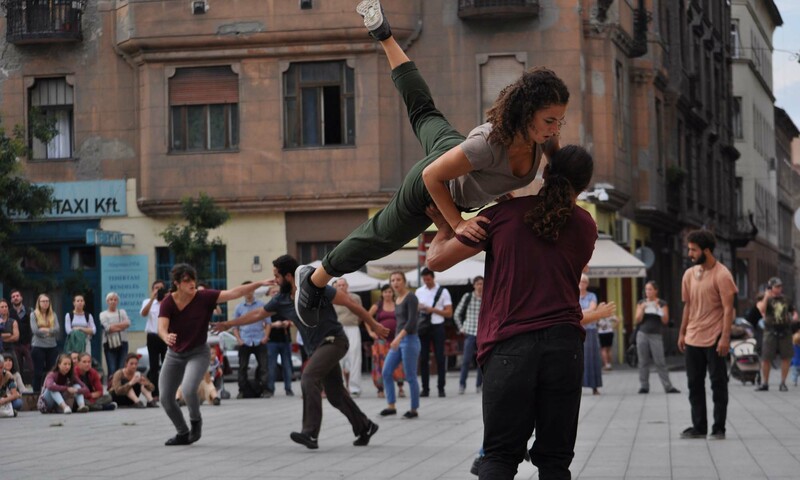 I feel privileged that I could see the performance SHAPERS, developed through the collaboration project, in three different countries, in three different contexts – in front of a mosque in Alexandria, in front of a museum in Sarajevo and in front of a shopping mall in Marseille. Thus the dance piece could encounter with religion, with history and with commerce in the three cities. I felt that it would be highly relevant to present SHAPERS also in Budapest – and make it encounter politics in a way. The nationalism and xenophobia in the official Hungarian political discourse is frightening and extremely dangerous, leading to those kinds of actions when people with darker skin are beaten up by “real” Hungarians. The beautiful and powerful performance by 8 dancers from Arab and European countries represents the openness towards other people for me, and I wanted to bring this openness and acceptance to the toxic atmosphere what the government propaganda creates in Hungary. Choosing the location for an art project in public space is always a crucial aspect of the local adaptation, and it was even more important for me to find a meaningful place for SHAPERS, because of the above mentioned reasons. I had suggested several options to Anne and Jean-Antoine by email, but even I wasn’t convinced if they were good suggestions, when Rákóczi square came to my mind, they also became immediately enthusiastic about it. Rákóczi square is situated on the border of a poorer and ambivalent district of Budapest, mostly habited by Roma population, which used to be a disadvantaged area earlier, but it is under development and gentrification in the past years. We have programmed several projects in this district, very often in collaboration with local habitants. Furthermore a partner association to our festival, MindSpace runs their activities in the market hall at the square, so they have a strong connection with people living in the area, and they also helped us to organise the post-performance talk in the market hall after its opening hours. I feel that our choice for the location proved to be a good one, people from the neighbourhood and professionals from the Hungarian dance and cultural scene came and watched the performance together. At the end, a Roma woman told me, that “These guys really know how to dance. Obviously we gypsies know it better, but they are also really good at it”. In 2018 PLACCC continued its work of the past 10 years, once again hosting site-specific artistic events in public spaces and at unique venues. The keywords of the festival for this year were body and technology, with a programme mainly consisting of dance productions and projects based on new technologies.